The Staction web app is included on all of our paid accounts. 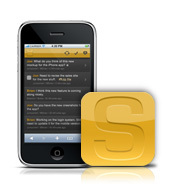 It's by far the best way to use Staction from your iPhone, iPod, or iPad. We've done our best to optimize the keyboard experience you love on regular Staction to be easily touchable on iOS. 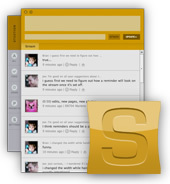 The Staction AIR app lets you use Staction straight from your desktop. You’ll get access to all the most useful features of Staction with lots of new stuff that makes using Staction even faster. With a custom interface, auto-login, tabs, and keyboard shortcuts, we think it's a great alternative to the browser. First you'll need to have Adobe AIR installed. Second, download and run the Staction installer. The Staction widget works with Mac OSX dashboard and gives you a quick simple view of your Staction account. The ability to read, tag, and post is now just a click away! The Staction API lets you take advantage of all the cool things Staction can do, and lets you use them in your own apps. We’re very interested in fostering the growth of lots of apps that interact with Staction. We’re really excited to see all the exciting things our users will do with the API. How can I send a message to just one person? Sign up for Free Today - 5 seconds and no confirmation email!